Gift92 helps those in real need to build a stable home. We help people with limited finance and receiving state benefits to furnish a property. The charity has been doing this since 1992. Many of those we help have moved into an empty property and do not have the funds to furnish it. We supply the essential furniture and household items to help them and their family create a home. We collaborate with several local agencies and charities to enhance the household items clients receive through our service. Our work is supported by generous members of the public who donate usable furniture and household items, we are always in need of more due to demand. 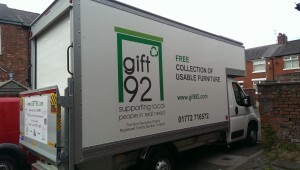 The furniture collected has enabled us to help over 750 people in 2018. We offer a FREE collection service from Monday to Friday 9am to 1pm. If you have any items in good, reusable condition that you would like to donate please call us on 01772 716572 or email us at mail@gift92.com. We also welcome donations to support the costs of running our service – click on the Donate button above to donate via Paypal.